Barry Jones passed away Sept. 15, 1999. 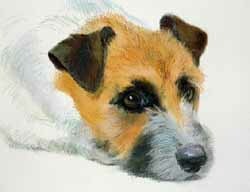 He was one of Britain's most dedicated terriermen and was professional terrierman to the Cotswold Foxhounds in Andovers Ford, and a former Chairman and President of the Fell and Moorland Working Terrier Club, and the founding Chairman of the National Working Terrier Federation. The chest is, without doubt, the determining factor as to whether a terrier may follow its intended quarry underground. Too large and he/she is of little use for underground work, for no matter how determined the terrier may be, this physical setback will not be overcome in the nearly-tight situations it will encounter in working foxes. It may be thought the fox is a large animal - to the casual observer it would appear so. However, the bone structure of the fox is finer than that of a terrier, plus it has a loose-fitting, profuse pelt which lends itself to flexibility. I have not encountered a fox which could not be spanned at 14 inches circumference - this within a weight range of 10 lbs to 24 lbs, on average 300 foxes spanned a year. You may not wish to work your terrier. However, there is a Standard to be attained, and Spannability is a must in the Parson Russell Terrier. With so many variations of hand size a more precise statement of average hand span is required. The way I find easy to explain is to take a round object of four and a half inch diameter, place your two thumbs and index fingers together forming a circle - this is your span. Some will not be able to cover the entire distance, others will have an overlap. Either way, when spanning the person will bear in mind their "plus or minus" factor and be able to gauge the four and a half inch diameter, which is approximately 14 inches circumference. This size of chest in a terrier of 12 inches to 14 inches height will look and be balanced, allowing heart and lung room, with the flexibility to follow its quarry in underground work. Regarding the shape of the chest -- this should not of course be round (barrel-chested), rather the shape of an egg in profile, large end uppermost, allowing free movement of the forelegs. Too large a chest will put out the elbows causing poor movement, so it is not only from a working point that the chest should be of the correct size. "I have not encountered a fox which could not be spanned at 14 inches circumference - this within a weight range of 10 lbs to 24 lbs, on average 300 foxes spanned a year." Approach the terrier with its full knowledge of being handled -- do not grab or suddenly place hands. With the terrier on the ground, not more than the forelegs off the floor, place hands in a direct line down around the chest directly behind the elbows. The lifting of terriers off the ground, sometimes to chest height, and in extreme cases higher, causes distress and tenseness. I cannot recall any guidelines for spanning apart from the average hand size, which of course does not exist! This method is what evolved with the working and judging of terriers. I find it works well with practice and a little forethought. Maybe there is a better idea?